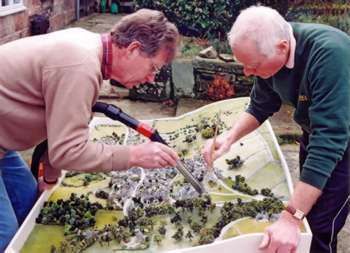 The idea of making a model of Winster originated in the Local History Group, and a small number of enthusiasts began making it in 1997 as a millennium project. It took much longer than expected, but after five years of sporadic work it was unveiled to the public at Easter 2002. 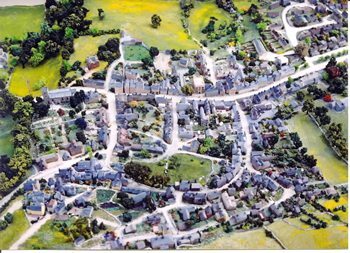 The original plan was to show the village as it had been 100 years ago, but later it was decided to reproduce things as they are in the present day, so that nobody would feel left out. This meant that the base of the model had to be extended by 6 inches to make room for housing that had been built in the 1950s and 1960s. May 2000 was chosen as a cut-off date, so any developments later than that were not included. Winster is an ancient village that grew prosperous in the eighteenth century because of the boom in lead mining at that time. Situated among beautiful limestone hills, it has quaint cottages set into the hillside, connected by a warren of steps and walkways. At one stage the model-makers thought of showing the underground features as well as those on the surface, but it proved too complicated to include the mineshafts and the complex web of passages connecting them, so the plan was abandoned. But even the surface details took longer to make than anyone in the group ever imagined. 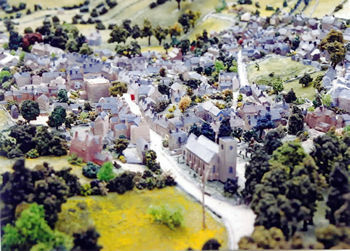 The model is now displayed in Winster Market House, by permission of the National Trust, alongside a large aerial photograph of the village.